Ottawa, February 2, 2015 – TransCanada’s Energy East pipeline president, Francois Poirier, came to Ottawa today, expecting to be the star attraction for a crowd of over 200 who paid to listen to his speech at the Chateau Laurier. Instead, his talk was interrupted by Ottawa residents upset with TransCanada’s plans to ship 175 million litres of tar sands bitumen through Ottawa every day. 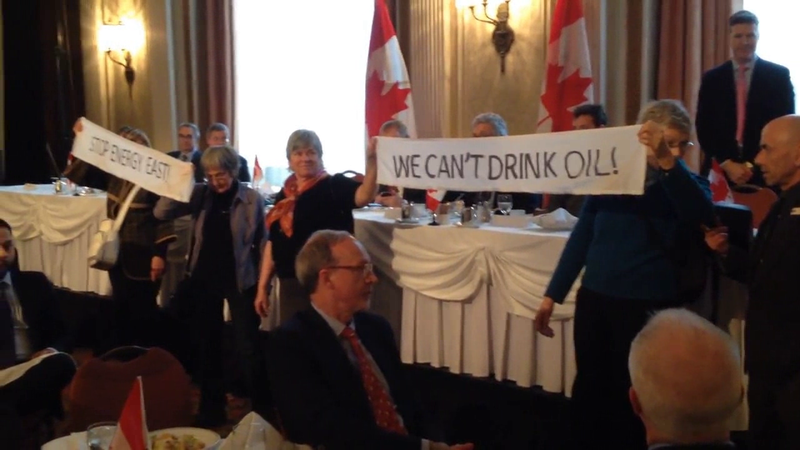 The protesters unfurled two banners saying “We can’t drink oil!” and “Stop Energy East!” before Poirier could take questions, as the protesters stood silently in front of Poirier before they were escorted from the room by security. Other attendees had paid seventy-five dollars to attend the lunchtime event, where Poirier was the main speaker. He was there to sell the Energy East pipeline’s economic benefits, which were disputed by the protesters present. A recent report by the journal Nature indicated that Canada must leave 85% of proven tar sands deposits in the ground to enable a chance at containing global warming under 2 degrees, effectively allowing for only 500,000 barrels a day of tar sands oil to be produced over the next forty years. TransCanada’s Energy East pipeline would be destined to carry 1.1 million barrels every day. Don’t piss off seniors, they fight hard, hooray for them hope others follow them. I nearly went to this Canadian Club event myself, but other things got in the way. But what I have done is make a submission to the Ontario Energy Board (OEB) highlighting TransCanada Pipelines Inc.’s unsatisfactory treatment of Evan Vokes, the metallurgical engineer with a big responsibility for pipeline safety. Personally I don’t take a position on whether Energy East should proceed or not – but if it DOES proceed, one thing is absolutely beyond doubt: the job must be done PROPERLY. As things are, I’m not convinced that it will be done properly and TransCanada Pipelines Inc. must demonstrate good faith by treating Evan Vokes properly; if they don’t, then how can we be assured of satisfactory workmanship during construction? As we know, TransCanada Pipelines Inc. are keen to get on with building the Energy East pipeline project. I still don’t see any evidence that TransCanada Pipelines Inc. are going to apologise to Evan Vokes for dismissing him, compensating him for loss of earnings since his dismissal and at least offer him his job back. How can TransCanada Pipelines Inc. possibly give us satisfactory assurances that the mistakes on Keystone Phase 1, etc., will not be repeated if they fail to rectify the situation concerning Evan Vokes? It seems to me that everyone involved is “…looking the other way…” and hoping that this problem will just “…go away…” on its own. I have everything documented. Feel free to ask me questions. Of course TransCanada Pipelines Inc. might have undertaken an internal management “shake-up” in order to change the company’s internal management culture, and found someone else who will do just as good a job as Evan Vokes did. But so far we have heard nothing to that effect – and even if they had done this, ignoring the “un-finished business” involving Evan Vokes would simply serve to prove that the same rotten management culture is operating within the company. How can anybody possibly see that as acceptable corporate conduct? We’re not just talking about amoral /unfair conduct towards Evan Vokes here, but basic safety considerations – because safety partly depends on certain people like Evan Vokes being there to ensure that the work is done properly. What would TransCanada Pipelines Inc. ‘s C.E.O. Russ Girling have to say about this?